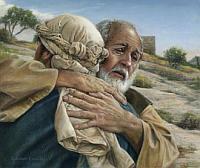 Sometimes the emphasis in this Sacrament is on 'confession' of sins when it whould really be on the Father's forgiveness, as in the parable of the Prodigal Son. It is a beautiful and powerful Sacrament. The sacrament of Reconciliation takes place each Saturday at St John's Church between 11.00 and 11.30 a.m and again between 5.15 – 5.45 p.m. However, if you need to see a priest in a setting other than the Church then please contact us by visiting, phone or email. More on the Mass: Some may be surprised that most of our services are Masses. Mass to Catholics is much more than a 'service' assembled by people. It is something given to us by Jesus Christ and has been a treasured act of worship from the earliest days of the Church. At once, it purifies, enlightens, unites, strengthens and redeems us through the power of God's Grace present in the Eucharist. This is God at work, not us. You will find times of Masses for the coming week on the parish bulletin. Baptism is the most important sacrament, in which each person is adopted as a Child of God and becomes a member of Christ's body – the Church. Because of its importance and the commitment that it involves, some preparation is essential. Therefore, any parent wishing to have a child baptised comes to a preparation evening, which will ensure that the baptism service is meaningful and an experience in which they feel involved. This should be the most momentous and wonderful occasion of our lives. As a Church, it is a privilege for us to be involved in your marriage. We will do everything we can to make sure that the service here is the highlight of your wedding day. In order that we might prepare our programme for 2019, we need to have an idea how many children we will be preparing. 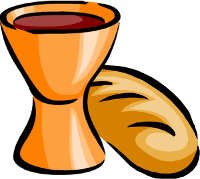 If your child attends a non-Catholic school and you would like them to receive either Communion or Confirmation in 2019, could you please contact Wendy at the Parish Office (01827 769403) before the end of September. 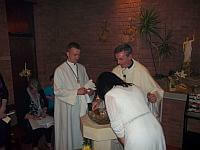 Communion children must be Year 3 or above and Confirmation children must be Year 6 or above. First Communion and Confirmation are done together in the case of adults.